Scholarly research papers of up to 10,000 words that contribute to a better understanding of a particular defense or national security historical issue. To order printed hard copies of these and other ILW publications, send an e-mail to [email protected] or call 800-336-4570, ext. 4630. Please provide your name, address, daytime number, the title and number of the publication you wish to receive and, if you are a member of AUSA, your member number. In this Land Warfare Paper, Westen notes the increasing chemical, biological, radiological and nuclear (CBRN) capabilities of U.S. adversaries. To focus the development of efforts in response to this growing problem—a problem compounded by current fiscal constraints—the Department of Defense (DoD) recently created a new strategy for Countering Weapons of Mass Destruction (CWMD). This monograph provides a background for viewing the new DoD CWND strategy, describes the risks the Army faces in current and future CBRN threats, identifies how the institutional Army is meeting the DoD CWMD strategy and makes recommendations for the Army and DoD to lower risks. In this Land Warfare Paper, the author examines and analyzes this rebalance in four areas of campaign design: land domain, campaign framework, structural reorganization and an overview of the Campaign Assessment Process. With its elevation to a four-star headquarters, U. S. Army Pacific is supporting this new theater army campaign design and in doing so is driving Army activity in the region in accordance with national security objectives and the Army Chief of Staff’s vision for the force. In this Land Warfare Paper, author Greg H. Parlier describes how the British pioneered what they called Operational Research (OR) during World War II by combining civilian scientific talent with operational staffs, thereby synthesizing the art of warfare with the application of the scientific method. The U.S. Army is currently experiencing a postwar drawdown at the conclusion of more than a decade of conflict. OR is at a crossroads and its current trajectory must be properly aligned with what really needs to be done. The author derives enduring principles and applies them to recent combat experience, describes opportunities for applying strategic analytics to contemporary challenges, addresses organization and professional development and offers several recommendations to resurrect, restore, renew and transform OR for the Army. This Land Warfare Paper states that the cornerstone of landpower’s historical and future success hinges on the human dimension, particularly physical and mental resilience. The military has struggled with negative impacts of poor sleep, activity and nutrition throughout history. The current costs to readiness, recruitment, retention and health require a comprehensive strategy to ensure that the military is able to meet the future security needs of our nation. The author outlines the importance of health for both the military and the nation’s youth and provides recommendations to enhance readiness and resilience for the future military force. This web-exclusive Land Warfare Paper advocates training servicemembers in the RC to respond to cyber threats and to assist in building cyber defenses for the Army. Because these servicemembers are already in place and would not require mobilization and because many of them bring cyber capabilities from their civilian jobs, giving them an education in cyber warfare would be an economical investment that would bolster the Army’s capability. Building an “operational cyberspace reserve” would provide agile and adaptive leaders and would integrate experienced network operators who use innovation and initiative to support Army and U.S. Cyber Command requirements. This Land Warfare Paper looks at U.S. military undertakings in various locations during and since World War II—such as Normandy, Korea, Vietnam, the Persian Gulf, Kosovo and current operations in the Middle East. Using these examples as a backdrop, the author discusses the positive and negative methods of unified and joint operation doctrine implementation seen in recent history. The subsequent development of the theories of joint doctrine is a result of lessons learned in setbacks and in achievements. Looking to the future, the U.S. Army has reevaluated its doctrine for the employment of landpower; that reevaluation is comprehensively set out in a newly completed series of 15 Army Doctrinal Publications, which together provide the requisite guidance needed for successful land control operations. This Land Warfare Paper begins by examining how certain characteristics of unlit spaces impact SOF operational planning. These five characteristics—pertaining to aspects such as the stability of a nation’s governing body, internal infrastructure and overall development—occurring in varying degrees and combinations, are described in detail in the Framework for Unlit Spaces. Depending on the nature of any given unlit space, SOF operational planning and engagements will be affected in different ways and will have to be conducted with malleable methods. Finally, the author looks at two case examples—Afghanistan and Somalia—to demonstrate how the political environments in conjunction with the physical environments during two different time periods present altogether different planning considerations. Because of the potentially wide variance of circumstances within unlit spaces, SOF planners must fully understand the physical and cultural nuances of their operational environments if they wish to conduct successful operations. This Land Warfare Paper begins with a discussion of the three pillars of the German Elastic Defense—dispersal and depth, establishment of the vacant battlefield and tactical agility—and the details of the practical application of this tactical military philosophy. Having laid a thorough foundation with his explanation, he shows how this German defense method can be suitably and beneficially adapted to meet the needs of both the Army and the Marines in the reorientation of operations that comes hand in hand with the drawdown in the Middle East. This study will be of particular interest to strategic landpower advocates. This web-exclusive Land Warfare Paper considers the nature of the emerging global security environment. With the spread of economic liberalism that gained foothold after the conclusion of the Cold War, one might think that the 21st century is the perfect time for the modern democratic state to be a ubiquitous institution. However, between power vacuums developing in formerly autocratic states and economic troubles becoming more prevalent, the atmosphere of the world is increasingly toxic to the values upheld in Western democracy. With that being the case, nation building, and even city building, is presently beyond the scope of the diminishing resources and capabilities of the American military. Given the restrictions that the Army is facing in coming years, the author suggests limited policy objectives and operations and calls for further discussion of the implications that the changes in global politics demand of American foreign policy. This Land Warfare Paper looks at the patterns of rising and falling support the Army has received, patterns which have accompanied every war that the United States has seen since the Spanish–American War. While it is natural that with the conclusion of each war support for the military should decrease, it is nonetheless vital that both civilian and military leaders provide for the uninterrupted sustainment of resources that will, at a minimum, allow for the optimal organization, training and equipping of Soldiers. When leaders invest excessive time and effort in changing external strategic policies, internal growth and structure will necessarily suffer. This will leave the Army ill-prepared to face inevitable military challenges, resulting in botched maneuvers that are costly not only in equipment but also in Soldiers’ lives. The authors posit that the strategic and institutional lessons learned from every major encounter that the United States has faced in the past 115 years all demonstrate a need for increased focus on internal Army improvement. This Land Warfare Paper addresses the unknown nature of the challenges that the Army will face in the coming years. As a result of significant and continual developments in technology, the ability to predict and plan for specific conflicts and encounters is increasingly marginalized. Technology can be used against American forces as well as utilized by them. Thus, the author advocates a cooperative functioning in movement forward among Army Design Methodology, Mission Command and the increasingly large breadth of capabilities provided to the Army in the developing network of the cyberspace world. This Land Warfare Paper provides a policy analysis on how the U.S. Army can best institutionalize a stability operations capability. Drawing evaluation criteria from Army Doctrine Publication 3-0, Unified Land Operations, three possible policy options are reviewed with a specific focus on the effect of timeliness in the transition between combat and stability operations. The paper concludes with recommendations for future courses of action that should be undertaken in order to insure a proper transition. This Land Warfare Paper discusses the nature of cyberspace operations in general, the need for enhanced cyberspace operations and expresses a viable way ahead for future cyberspace operations in Afghanistan. The authors posit that additional research and coordination should be conducted to better define and develop requirements for cyberspace capabilities, command and control of cyberspace operations and integration of activities in a manner that supports the International Security Assistance Force (ISAF) commander, the operations of regional commanders and related strategic shaping and global counter terrorism (CT) pursuit operations. This paper was designed to provoke additional thought about cyberspace operational relevance, suggest necessary change and enable future success in Afghanistan and future conflicts. In this Land Warfare Paper, Donald Vandergriff elucidates that when Mission Command functions ideally, once subordinates understand the intentions of their commanders they are responsible for using their creativity and initiative to adapt to changing circumstances and accomplish their missions within the guidelines of those initial intentions. He questions the degree to which modern technology allows for too much oversight in mission execution and argues that unless the Army seriously examines its personnel system and the current force structure and implements necessary improvements, the vital principal of Mission Command will continue to be lost. With this necessity in mind, Vandergriff suggests the widespread use of Outcomes-Based Training and Education, as it provides a solution for how best to teach Mission Command in our 21st century world. In this Land Warfare Paper, Adelaido Godinez argues that Upton’s proposed strict dichotomy is problematic, for while it is true that the Army should not be governed by political agendas, it must be aware of the relevant and vitally important policies of our nation. In addition to this first criticism, the author takes issue with Upton’s position that the problems encountered at a tactical and operational level are similar enough to be useful in solving problems at a strategic level. This Land Warfare Paper discusses the case being made by the current Army Profession campaign for a reevaluation and assessment of the Army as a profession and the attributes of the Army Professional. The author outlines a model for leader development anchored in learning agility and the notion that learning agile leaders apply previous learning and embrace opportunities for further learning in new, novel or ill-defined environments. This Land Warfare Paper discusses the changes in the counterterrorism (CT) force profile and method of operating over the past ten years. As open coordination between battlespace owners and the CT force became necessary for the CT force's freedom of action, in January 2009 the CT force aggressively revamped its method of operating in Afghanistan. With this study, winner of the 2012 AUSA/Army Capabilities Integration Center writing contest, the author seeks to ensure that lessons learned regarding CT force transparency will be practiced and internalized. This Land Warfare Paper is based on an examination of available primary sources—field orders, after-action reports and personal accounts—reinforced with secondary source analysis. It demonstrates that Ridgway achieved tactical success in World War II in Operations Husky, Neptune and Market but did not adequately apply operational art until Operation Varsity and the Battle of the Bulge. Although he completed all the military education available in his era, it was only after the intense crucible of three combat operations that he was able to apply operational art successfully. This Land Warfare Paper posits that the Army would be better served if it transitioned to a system focused on keeping and developing selected senior field-grade officers for a 40-year career horizon. The paper explores the time, experience and energy required to develop the knowledge and expertise of officers to perform effectively in complex operations. In the author’s view, the Army should be stanching the tide of retirements of senior officers, who depart just when they offer the most value to the organization. This Land Warfare Paper discusses seven distinct yet interrelated energy and environmental challenges currently facing China. The author discusses each of these challenges—energy demand, the water crisis, cumulative pollution effects, rapid urbanization, a must-grow-to-survive economy, the limitations of the central government and the long-standing attitude that humans can completely control nature—and their effects on China’s economic growth and stability. These issues already create unhealthy living situations and unsustainable energy sources and will soon test the legitimacy of China’s central government. This Land Warfare Paper discusses the development of future weapon systems, including those used by the dismounted Soldier, and proposes that future defense technology would benefit from a historical review of the evolution of weapons. The author presents the key stages in the development of weapon systems as case studies, examining each stage with sufficient detail and in its historical context. Each case study provides lessons that can then be applied to modern weapon development. The author’s analysis of these case studies leads him to propose an instantiation of a modern system with regard to Battlefield Operating Systems. This Land Warfare Paper relies upon recent research and findings in the fields of species evolution, ecosystem transitions and ecosystem management to provide recommended actions for the Army to take within each phase of its force modernization process: 1) operational environment and concept development; 2) capabilities integration and development; and 3) force development. By applying metaphors from genetic variability, natural selection, evolutionary strategies and natural system management activities, the Army could develop operationally adaptable forces that can survive and rapidly evolve to operate successfully in the current environment as well as in any potential future world that emerges. This Land Warfare Paper examines decision science, a field that explores the interconnected influences of emotion, neuroscience and psychology in shaping human judgments. The Soldier as teammate, team leader, decisionmaker, member of a household and individual can benefit from current and future decision science research. It can start a positive chain reaction of better-informed decisions for the Soldier at home and on the battlefield. The author argues that creating a cadre of “decision engineers” has the potential to bridge existing gaps between science and military application and to push decision science further, by looking for continuous applications within the domain of the Soldier as individual and as leader/decisionmaker. The basic result of this research—greater emotional self-awareness for Soldiers—can come about through the growth, understanding and application of decision science. This Land Warfare Paper examines how Mission Command would operate in contrast to the environment the U.S. Army has known since the Industrial Age. According to the author, Mission Command would inevitably see a reduction in undue competition between officers and noncommissioned officers; with this shift, trust and flexibility would become more widespread throughout the institution. This paper addresses the cultural ramifications that make the U.S. Army personnel system perfectly suited to support Mission Command because its members are managed as professionals. In his support of Mission Command, the author poses many questions that must be addressed in order to develop a feasible and efficient personnel system to support the U.S. Army in the 21st century. This Land Warfare Paper discusses how the military–political line has moved since the United States won its independence. Legislation intended to keep the country’s military leaders and servicemembers out of political debates and decisionmaking has often proved insufficiently specific, opening statutes and regulations to a wide variety of interpretations. The author attests that legislation is not the primary issue in determining the military–political boundary. Rather, the country’s military and political leaders need to reassess how this line should be drawn when considered alongside the current operational environment, generational shifts and technological innovations. This Land Warfare Paper examines the current regional dynamics that explain how national security drives Pakistan’s ultimate interest in controlling Afghanistan. To preserve national unity, Pakistan must use Afghanistan to guard against internal militant groups as well as its aggressive Indian neighbor. Stable national security is also necessary for Pakistan to achieve the economic growth necessary to achieve global leadership within the international community. The author also provides recommendations for future U.S. strategies and finds that failure to understand the complexities analyzed in this article could lead to a failed NATO strategy in Afghanistan and a debunked U.S.–Pakistani–Afghan partnership. With Pakistan’s security, politics and economy inextricably linked with Afghanistan, the relationship between these two countries must be recognized by regional and international policymakers. This Land Warfare Paper discusses a whole-of-government approach to address future security threats. This approach calls for government agencies to leverage civilian expertise to provide integrated “soft-power” solutions to complement proven “hard-power” options. The paper examines how the U.S. government’s plan to combine these two approaches into an effective strategy (“smart power”) also necessitates an understanding that the development of junior officers is the most effective way to shape organizational culture. According to the author, this bottom-up approach requires a long-term perspective but will ultimately create the most durable cultural change. This Land Warfare Paper examines how military planners can utilize modern scientific principles to improve understanding of insurgencies and leverage what is learned into even better counterinsurgency (COIN) doctrine. In particular, the author addresses what we can discern from Disruptive Change, Complexity Theory and Markov Chains to help in formulating winning COIN strategies that will prevail in the 21st century. The paper discusses how the Manoeuvrist Approach, which British military doctrine defines as a focus on shattering an enemy’s will to fight through skillful identification of the enemy’s vulnerabilities, is instrumental to analyzing the insurgent fight. This Land Warfare Paper shows why the utility of long-range future modernization planning should be revisited in this era of persistent conflict. According to the author, the complexities of the environments for which the Army is required to plan makes predicting the future—and being prepared for the next war—impossible. The author examines changes that occurred during the post-Vietnam era, includes a review of past Army futures studies and discusses the Army’s most recent attempt at modernization, the Future Combat Systems program. The paper uses the National Security Strategy, the Quadrennial Defense Review and the Army Modernization Strategy to suggest a framework for future modernization and a less risky method for long-range futures studies. This Land Warfare Paper combines existing scholarship with long-forgotten references and unpublished original sources to achieve a comprehensive picture of Fox Conner, a dedicated public servant whose life and service to the Army and the nation are revealed primarily through passing references in the memoirs of other great men. Conner’s influence helped to shape the careers of George Patton, George Marshall and, most notably, President Dwight D. Eisenhower. The portrait that emerges here also provides a four-step model for developing strategic leaders that still holds true today. This Land Warfare Paper addresses the question of NATO’s relevance by examining the results of its geographical expansion. Regardless of the conclusions reached in NATO’s 2010 Strategic Concept, the fact remains that the alliance is only as strong as its member states. A fundamental question over the past years has been whether or not NATO expanded too quickly to include members not able to effectively contribute to the collective security capabilities necessary for it to remain a credible defensive alliance. The paper examines this question by taking a closer look at the defense transformation of Slovenia and Bulgaria, two Southeast European states both admitted during the 2004 round of expansion. Today's Training and Education (Development) Revolution: The Future is Now! This Land Warfare Paper discusses the changes the Army is making to its educational system to provide Soldiers with the best tools for success on the battlefield. Today’s highly complex operations have emphasized the importance of quality decisionmaking at junior levels. 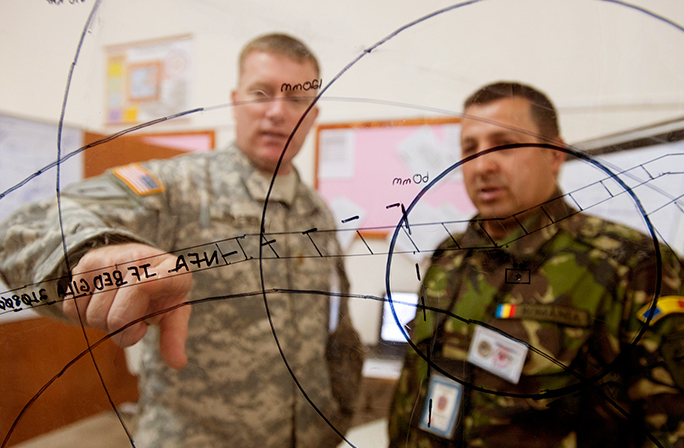 Even with modern command, control, communications, computer, intelligence, surveillance and reconnaissance (C4ISR) capabilities, the noncommissioned officer or junior officer on the ground sometimes has the best situational awareness and thus is likely to make the best decision—but only if he or she is equipped, intellectually and culturally, to properly assess the situation and creatively arrive at the best solution. Adaptability, critical thinking and creativity have become critical skills for modern Soldiers. The Army’s new approach, Outcomes-Based Training & Education (OBT&E), is an educational philosophy that both teaches basic skills and aids the development of leaders, using the Combat Applications Training Course (CATC ) and the Adaptive Leader Methodology (ALM). These new training and education tools will produce the kind of flexible, adaptable Soldiers and leaders the modern battlefield demands. This Land Warfare Paper traces the evolution of the role played by NCOs in Soldier training over the past 234 years. During the Revolutionary War, the Continental Army reflected the egalitarianism of the new democracy, with NCOs seen as little different from the commissioned officers under whom they served. By the start of World War I, the treatment of NCOs more closely resembled that of the Soldiers for whom they were responsible. Today’s NCO Corps reflects America’s increased education and professionalism; the Army’s NCOs are widely recognized as among the finest military professionals in the world, and the current system of Soldier training is the result of more than two centuries of learning and improvement. It reflects numerous hard-earned lessons and is an essential part of what makes NCOs the "backbone of the Army." This Land Warfare Paper attempts to shed light on the considerable evolution in manning practices that has occurred in the last eight years by reviewing in detail the mobilization manning processes of two services—those of the reserve components of the Army and Air Force—along with a brief look at certain aspects of the Marine Corps Reserve process. Major topics examined include Army and Air Force processes for selecting units for mobilization; cross-leveling to bring mobilized units to full deployment strength; replacement operations aimed at keeping already-deployed reserve component units fully manned; and procedures for bringing reserve component volunteers onto active duty for contingency service. This Land Warfare Paper discusses the logic behind a notion of persistent security; how land forces play a critical role in sustaining it; and the constant ebb and flow of firepower versus maneuver warfare to see how modern armies have evolved to meet the threats of their day. This historical vignette is applied to recent lessons learned on the battlefield to create a vision of how to adjust formations and methodologies for force employment in future wars; it is important to analyze how modern doctrinal principles came to exist, whether as a result of the changing environment of warfare, budget constraints or both. Finally, the author argues for dominant land combat forces capable of instituting secure environments globally, thus allowing stability to flourish in these same environments. This Land Warfare Paper discusses the security vulnerablities of websites and computer networks and how they have been and can be exploited, and provides solutions that DoD can implement to protect itself against a cyber attack. Simply having defensive steps in place should an attack occur is not enough to protect America from would-be hackers. According to the author, DoD's cyber defense strategy needs to be proactive, dynamic and polymorphic in nature to anticipate future attacks. However, this strategy requires personnel with intensive training expertise in cyber defense and the infrastructure necessary to maintain a pool of specialists in cyber warfare. Education, research, manpower and operations for a proactive self-defense in cyberspace must be fully funded now to prevent a disaster in the future. Collateral Damage: How Can the Army Best Serve a Soldier with Post-Traumatic Stress Disorder? This Land Warfare Paper takes a look at the history of PTSD in the U.S. armed forces from the American Revolution to the current conflicts and at recent studies on the topic. The author, a Soldier whose Soldier son has suffered from PTSD since he returned from Iraq, offers Soldier testimonies, the perspective of a psychologist who has treated Soldiers for the disorder, and recommendations for Army action and follow-on studies. This Land Warfare Paper explores the significant demobilization of forces as the Army transitioned from full-scale combat to peacetime occupation after World War II, the drastic reduction in the number and types of divisions required in Europe and the Pacific in the initial stages of the Cold War and during the Korean War, and the impact of that restructuring on the Army then and now. This Land Warfare Paper takes a look at the CAPSTONE and WARTRACE programs, the emerging lessons from Operations Enduring Freedom and Iraqi Freedom, and the cyclical Army Force Generation model that is displacing the old contingency-based planning model. ARFORGEN, coupled with the advances made previously under the Army National Guard Combat Readiness Reform Act and Training Support XXI, offers significant advantages over past practices to effectively and efficiently enhance Army readiness. This Land Warfare Paper discusses the difficulties of monitoring joint operational logistics capabilities as they move from their source through strategic lines of communication and tactical levels to meet joint force objectives. According to the author, the character and conduct of future conflicts make the current approach of conducting distinct service sustainment operations unacceptable. This Land Warfare Paper discusses the Army's "old economy" personnel system (in terms of recruitment, retention and, more broadly, talent and skill management) and the inordinate strains placed on this archaic system by the pressures of the strategic threat environment of the future and the mandate to substantially increase the size of the Army in the next five years. This Land Warfare Paper discusses post-Civil War Reconstruction, its mismanagement and the resulting failure or subversion of most of its strategic political objectives. After the war, the Confederate capital and most of its major cities were under U.S. control, but a vicious insurgency, shrewd political maneuvering, partisan domestic politics, insufficient resources and a lack of political, military and popular will resulted in the failure of U.S. postwar policy. Today's Army must learn from the lessons of this occupation; if the Army is to win the nation's wars, it must have a robust post-conflict capability. This Land Warfare Paper describes the rapid organization of Task Force 165 Military Intelligence battalion and the challenges the Army faced during the process. In early 2004, U.S. Army, Europe (USAREUR) was tasked to furnish a division-level MI battalion/task force to provide intelligence support to the Southern European Task Force’s 2005–2006 Operation Enduring Freedom (OEF) VI rotation. USAREUR did not have an available unit of this type and executed rapid planning to use existing units—and support from other major commands—to build the MI unit. The results of this team’s work were seen during the OEF VI/OEF 04–06 rotation, with lessons learned on how to better build these types of units incorporated into USAREUR’s military decisionmaking process and used during USAREUR transformation post-2006. This process can serve not only as a model for transformation and modularity, but also as a way to augment transformed units which may have less capability to meet current requirements. This Land Warfare Paper discusses the actions the Department of Defense (DoD) has taken to streamline resource management to provide a more joint outlook to weapon systems procurement and capabilities development. Since 2001, there have been major strides in the Pentagon’s strategic warfighting resource and risk process for creating systems that are “born joint,” and DoD is still trying to establish a common framework for a capability-based planning process for all the services. However, as with any major transformation, there will be areas where it can continue to improve. This paper recommends several changes to ensure DoD develops a joint force to meet the nation’s needs, with the intent to help senior leaders optimize investments in joint capabilities areas to meet current and future security challenges. This Land Warfare Paper discusses the current conflict the United States faces with Iran's nuclear enrichment program, a crisis that is making many nations nervous. Israel and the United States have strong motives to strike unilaterally against Iran's nuclear facilities, but unilateral action presents many risks while offering less than certain outcomes. This Land Warfare Paper argues that multinational military intervention will be required to resolve the situation. Military intervention has its limits; such actions would be difficult, says the author, but preferable to nonmilitary alternatives that are likely to fall short of U.S. goals. This Land Warfare Paper examines the origins of the Texas Militia as a National Guard unit to better understand the National Guard's federal and state roles in current operations. Historically, the question was how to raise a large force on short notice to defend the country while adapting to the traditional opposition to a large standing army. Today, the opposition has long since disappeared, but a major element of the ongoing debate over U.S. military policy is the balance among regular, National Guard and Reserve troops and how best to use them. Both the need to plan for a future that can never be fully predictable and the need to have a military able to meet expected and unexpected realities and challenges existed in the 19th century when the Texas militia was established, and those issues are still with us in the 21st century. This Land Warfare Paper assesses the boards used by the Army and Marine Corps in the development of air assault forces between the Korean War and July 1965. First, it discusses the strategic environment and how the services were influenced by it. Second, it briefly outlines the growth of the air assault concept after the Korean War. Third is a series of discussions on the boards used by the services; an outline of the force structure; and an analysis of the boards as potential models of transformation are also presented. Finally, an analysis of the applicable theories and the strategic implications of air assault forces and their long-term efficacy concludes the paper. This Land Warfare Paper explores the pioneering aspects of Ridgway’s leadership and outlines how he navigated the tumultuous early days of airborne training and warfare. The paper also illustrates the steps Ridgway followed to prepare the 82d for its successful participation in Operation Overlord. By applying lessons learned from Ridgway’s character and vision, current and aspiring military leaders can grow in their leadership ability. This Land Warfare Paper surveys some of the history and literature of asymmetric warfare, citing and critiquing some of the best attempts to define the term. The author adds his own discussion of the term, its concepts and its implications, and proposes his own definition in an attempt to resurrect the term before it becomes completely obsolete. America’s sole-superpower status forces us to continually engage in asymmetric warfare since no force can win a traditional war against us. Even traditional wars today—such as the first phase of Operation Iraqi Freedom—and in the future will have many asymmetric elements and implications, especially after the traditional war has been won. This Land Warfare Paper briefly examines Stability, Security, Transition and Reconstruction operations and recommends creation of an independent joint command—drawing on the example of U.S. Special Operations Command—to conduct them. Missions focused on these operations—overpowered by immediate lessons and imperatives from Afghanistan and Iraq—have likely received less attention than they did before the 11 September 2001 terrorist attacks on the U.S. homeland. Yet power projection for humanitarian purposes is a potent extension of a time-honored military principle into the realm of grand strategy. To be effective, however, the forces engaged in these missions cannot merely be assembled ad hoc from units designed, equipped and trained for major combat. This Land Warfare Paper examines Tukhachevsky’s life on a personal level, as a practitioner of war and as a military theorist, revealing an officer who was able to practice and convey in writing an uncanny conceptualization and prescient vision of modern warfare at the tactical, strategic and operational levels. His military prowess and writings on warfare significantly affected the Soviet military in the interwar years, Soviet operations on the Eastern Front against the Germans, and the development of operational thinking for the remainder of the 20th century and well beyond the borders of the Soviet Union. Tukhachevsky’s displayed military prowess in his writing on warfare and in practice merit him significant recognition for his contribution to the understanding, conceptualization and vision of Soviet warfare and all levels of modern warfare in the 20th century. This Land Warfare Paper briefly describes the fateful summer of 1940 that saw Germany victorious on the continent of Europe, which established the reason for the eventual Allied Liberation of France in 1944. There are many lessons—both political and military—to be learned from the fall of France in 1940. An irresolute French government, a weak allied alliance and a passive attitude in the face of fascism after the bloodbath of World War I allowed Nazi Germany to win the first rounds of World War II. The events of the summer of 1940 show how battlefield leadership, modern tactics and doctrine, and effective military organization won out over modern equipment. France had in many cases better equipment than Germany; it was how the Germans used what they had that counted. This Land Warfare Paper introduces and presents a systems approach to guiding an ongoing project that addresses many of the significant challenges confronting logistics transformation. The focus is on inventory management policy prescriptions illuminated through the prism of an enterprisewide supply chain analysis emphasizing Army aviation systems. The author concludes that as the U.S. Army transitions toward a readiness-focused force, the logistics piece of the force likewise needs to transition. Currently, it does not know how to transition because it has not sufficiently measured the true effectiveness of the inventory and supply system. This paper provides not only an argument for pursing such measures and a resulting transformation but also a framework in which to achieve both. This Land Warfare Paper takes a look at how the Modular Force design will fundamentally change the way Army forces conduct reconnaissance on the future battlefield. Tactical reconnaissance organizations will replace their traditional combat capability with a surveillance capability. This raises fundamental questions about the nature of effective reconnaissance operations: Is close combat with the enemy an essential part of effective reconnaissance? Do combat formations still have to fight for information or do modern surveillance technologies change this paradigm? The author seeks to answer these questions through an examination of Soldier interviews collected by the Center for Army Lessons Learned following the opening months of Operation Iraqi Freedom. The study conclusively determines that the rapid tempo of modern warfare has rendered lightly armored scout units virtually ineffective in the heavy force. This Land Warfare Paper examines the background of the major warfighting applications—such as the Joint Automated Deep Operations Coordination System (JADOCS), Portable Flight Planning System (PFPS), Force XXI Battle Command Brigade and Below (FBCB2) and Command and Control Personal Computer (C2PC)—used by the Army and other services. It demonstrates how these applications are duplicated in functionality and how they are unnecessarily divided between tactical and operational systems. By showing how the various applications use the same maps, drawing functions, three-dimensional viewing functions and common operational picture display functions, the author illustrates the logical necessity for change and proposes a single application to resolve these issues. This Land Warfare Paper examines the evidence that over the last hundred years military establishments and their political masters have underestimated the length and costs of their campaigns and have frequently had little idea of the actual nature of their undertakings. A common factor in this appears to be the desire that campaigns should be short, decisive and cheap, and therefore with less risk but a greater likelihood of popular support—to be “home by Christmas.” This delusion has often been reached irrespective of historical evidence and analysis of current capabilities. The result, according to Bailey, is that those seeking a short, decisive and cheap campaign have very often laid the foundations for the opposite. Their unpreparedness and delusions have abetted costly attrition, and the resulting bill in international calamity, casualties and materiel has been shocking. This unpromising context and the growing complexity of battlespace lead Bailey to pose several questions: What is the utility of U.S. military power today and in the future? Is it to be put to some greater mission than short, selective, warfighting operations? If the West is to have some neo-imperial mission to be “a force for good in the world,” has this mission ever been clearly articulated and its implications understood? Have American forces and other agencies been configured and equipped to do more than fight the wars that they would like to fight, rather than the operations which they will actually encounter? This Land Warfare Paper examines the importance to psychological operations of modern and versatile tactical video dissemination that complements tactical operations and adheres to force-protection constraints to bring video products directly to the target audience. At the close of the 20th century it was recognized that the most likely operations to involve PSYOP forces would be conducted in a "low-tech environment"; current post-combat operations in Afghanistan and elsewhere support this contention. This Land Warfare Paper looks at the traditional balance between education and training. In the author's view, recent developments suggest that as the Army requires its junior leaders, especially captains, to perform more complex tasks, the balance should increasingly tilt toward education in the captains' institutional experience to better prepare them for the situations they will face as the Army's most junior commanders. This Land Warfare Paper discusses the development and employment within V Corps of a successful team effort (Army and Air Force) known as "corps shaping"—the use of close air support aircraft directed by 4th Air Support Operations Group controllers in response to target selections made by the V Corps Fire Effects Coordination Center to attack Iraqi forces within the V Corps zone to shape the battlefield for subsequent divisional maneuver. This Land Warfare Paper uses historical research to develop an alternative framework for characterizing the enduring elements of land warfare. By describing the characteristics of the Algebraic, the Cognitive and the Moral realms of land warfare, the authors provide a relatively fresh and comprehensive frame of reference that can be used for a variety of purposes. One important conclusion of the paper is the importance of the Soldier as the ultimate instrument of land warfare. This Land Warfare Paper collaborate on an analysis of suicide bombings in Operation Iraqi Freedom. Their research details the historical and strategic context of this form of warfare, how it has affected Coalition forces in Operation Iraqi Freedom and how the U.S. Army needs to adapt to the enemy’s continuing use of suicide attacks in the future. Web exclusive. This Land Warfare Paper examines the intended nature of the U.S. Army's Future Force and offers specific recommendations for doctrinal development of operational surprise, tactical shock effect, and daring and creative leadership as the Army's Current Force evolves into a strategically agile and adaptive joint and expeditionary force. This Land Warfare Paper examines the requirements of the geostrategic environment of the 21st century for a transformed U.S. military—a capabilities-based joint force prepared and ready to dominate any situation across the spectrum of operations—with particular emphasis on land forces as the "instrument of choice to achieve durable strategic results and advantage." This Land Warfare Paper offers a concept of strategic theater operations in which the theater joint commander applies pressure against an adversary through multiple lines of operation conducted simultaneously and/or sequentially by joint multiservice forces. Each line of operation contributes to either an action or a threat of action against enemy centers of gravity. The authors focus on the role of landpower as a critical element that provides a direct and decisive means to defeat the enemy, reassure allies and establish post-hostility security. This Land Warfare Paper examines one of the most radical transformations in the Army's history—its move (in little more than 50 years) from a horse- and foot-mobile force to one that could move entire divisions by air (first by parachute and glider, then by helicopter). U.S. Army Civil Affairs—The Army's "Ounce of Prevention"
This Land Warfare Paper takes a timely look at one of the least known and most misunderstood Army missions—the Civil Affairs element of Army Special Operations. Although the paper predates (by just a matter of weeks) the war with Iraq, it goes a long way toward explaining what is happening now, in the aftermath of the fall of Baghdad. This Land Warfare Paper describes the challenges U.S. military forces will confront in the next several decades and how the Army must play its part in meeting them. This Land Warfare Paper explains the two roles of the Interim Force—to provide a rapidly deployable, highly lethal and highly mobile ground force capable of full-spectrum operations in a joint and coalition environment and to serve as a bridge from the heavier Legacy Force of today to the more mobile (and more lethal) Objective Force of tomorrow. This Land Warfare Paper examines the dimensions of China’s People’s Liberation Army, its organization, orientation and capabilities, and some of the challenges it faces in fulfilling its mission. The paper also examines the political-economic context of those challenges, especially with respect to Taiwan, the United States and other neighboring countries. This Land Warfare Paper examines application of the post-Vietnam Abrams Doctrine (which calls for the employment of U.S. reserve component forces as full partners in Army operations) in a global environment that finds the U.S. military called upon frequently to conduct non-wartime yet militarily compatible missions worldwide. This Land Warfare Paper addresses, in the context of the Army Transformation process, the immensity of the Army’s C4ISR (command, control, communications, computers, intelligence, surveillance and reconnaissance) challenges, the meaning of "information superiority" and the necessity to recognize and prepare for the many and varied threats of asymmetric warfare. This Land Warfare Paper analyzes the nature of change in the context of military organizations and identifies the internal and external factors involved in modernizing an army. The author contends that only by understanding the anatomy of change can a military leader succeed where many others have failed.